‘Never before has so much explicitly socially engaged art been produced as there is now.’ After this opening observation, the authors of Too Active to Act. Cultureel activisme na het einde van de geschiedenis (Cultural activism after the end of history) then proceed to thoroughly demolish this new type of engagement in the following 128 pages of their book. Gideon Boie and Mathias Pauwels of BAVO analyse the growing involvement of cultural players in all sorts of spatial projects and compare this with the practice of embedded journalism: ‘Just as embedded journalists report about today’s battlefields from the perspective of the occupying forces, so does a motley army of diverse cultural players nowadays make itself useful on the margins of far-reaching government measures and market operations.’ This, argue the authors, makes the new engagement fundamentally different from the old engagement that we are familiar with from the historical avant-garde. Whereas the avant-garde used its aesthetic know-how to undermine the status quo and try to go beyond it, the new engagement stays carefully in line with prevailing policy agendas. In a series of short, sharply formulated essays, we travel at breakneck speed through the landscape of the new engagement, with the authors bombarding a few emblematic projects with some pretty heavy criticism along the way. The first victim is Wouter van Stiphout and the WIMBY! project in Hoogvliet, which he helped design. The authors quote Wouter van Stiphout’s plea to set aside ‘critical attitudes’ in order to ‘be realistic’ and do ‘something useful’. According to BAVO, this is illustrative of the new engagement, which switches off its critical intellectual capacity in order to at least be able to sit at the controls again for a while. The result – so goes the critique – is that WIMBY! does not have its own story about the modernization of Hoogvliet but mostly supplies the existing, neoliberal-oriented programme of renewal with architectural acupuncture and marketing buzzwords. We race onward, past the conceptual design company Schie 2.0, which thinks that architects should not want to change anything; past Jeanne van Heeswijk, who therapeutically reconciles neighbourhood residents with the demolition of their neighbourhood; and past Rem Koolhaas and the idea that we should view marginal groups as ‘voluntary prisoners’ who ought not to be emancipated through architecture, but acknowledged for their ‘differentness’. In short, not much of the new engagement is left intact. 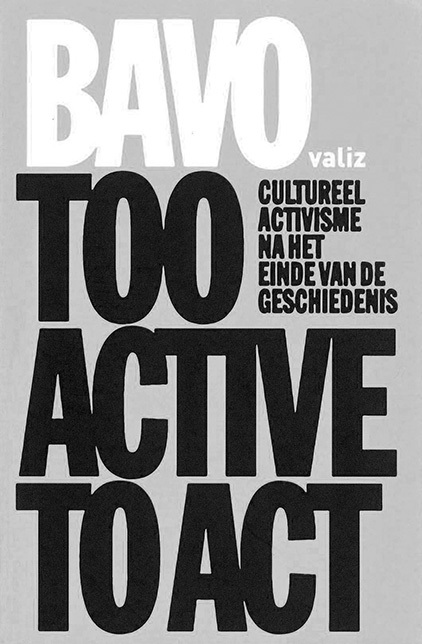 BAVO’s radical criticism makes few attempts to extend a hand to less politicized readers, in whom it might at times elicit indignation, even incomprehension. On the other side, the uncompromising, polemic tone of the book is a quality that distinguishes it from the often woolly discourse on renewal we are accustomed to reading. This style means that the subtleties are sometimes lost and the contrasts exaggerated. But logically enough, an attack on the polder mentality is never formulated in polder terms. This little book is the proverbial fox in the chicken coop, and in my opinion, one of the better foxes. What above all comes across is a thoroughgoing disappointment as to contemporary architecture’s refusal to formulate its own (emancipatory) programme. Strangely enough, this is also the strongest criticism that can be made against the book. The alternative that BAVO propose is the technique of over-identification. They derive this from the practice of the Slovenian avant-garde punk band Laibach, who developed a new way of rebelling against Tito’s Yugoslavian regime by propagating his logic in an overblown manner and playing the advocate of the devil. A more recent example also mentioned is that of a number of Swedish artists who managed to torpedo an unpopular megaproject by presenting an even more megalomaniac version of the project, which was believed to be authentic and accordingly generated a storm of controversy. For the successful use of a comparable principle of provocation, BAVO laud American filmmaker Michael Moore, the recently deceased Austrian theatre maker Christoph Schlingensief, and Dutch artist Martijn Engelbregt. By adopting this technique, BAVO shrewdly manage to evade the responsibility of formulating their own programme; after all, they only have to caricature that of the opponent. This gives them the possibility of shooting away at will, without ever having to expose themselves. Their recent proposal to appoint someone as a kunstmarinier (literally Art Marine, figuratively comparable to an Art Czar) in Rotterdam shows that BAVO meanwhile have got so caught up in this game of assimilation that even their supporters no longer know where over-identification stops and sincerity begins. The aim of such a practice, we read, is ‘to provoke the reputed critical forces in society’, which shows that the practice of over-identification is always limited by its dependence on ‘critical forces’ that do have a programme and dare to come out for it. Moreover, it turns out that BAVO themselves are extremely cynical about these ‘reputed’ forces, a cynicism that also refers to the fundamental change for which BAVO say they are striving, but in which they evidently do not entirely believe. ‘If it walks like a duck and quacks like a duck, we can call it a duck,’ as the saying goes. With the ironic engagement that BAVO adopts, that’s still very much the question. None of this alters the fact that Too Active to Act and the practice developed by BAVO in recent years are hard to beat when it comes to the power and sharpness of their criticism.